On Wednesday, July 11, United Way of Escambia County hosted a Leadership Panel discussion. Four local business leaders, including Donna Kirby, Pensacola Blue Wahoos’ Vice President of Operations, Britt Landrum Jr., Founder and Chairman of Landrum HR, Miller Caldwell III, Director of Business Development and Partner at Caldwell Associates Architects, and Clark Partington’s own Doug Bates, engaged with United Way Ambassadors to engage in in a discussion about leadership. 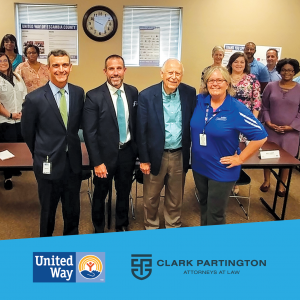 As an avid United Way supporter, Clark Partington applauds the efforts made by all participants as they help drive positive outcomes in Northwest Florida and beyond.